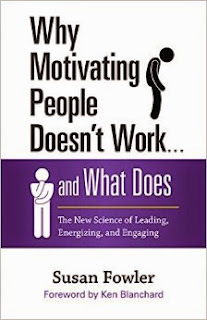 Fowler argues that leaders still depend on traditional carrot-and-stick techniques because they haven’t understood their alternatives and don’t know what skills are necessary to apply the new science of motivation. Her Optimal Motivation process shows leaders how to move people away from dependence on external rewards and help them discover how their jobs can meet the deeper psychological needs—for autonomy, relatedness, and competence—that science tells us result in meaningful and sustainable motivation. Optimal Motivation has been proven in organizations all over the world—Fowler’s clients include Microsoft, CVS, NASA, the Catholic Leadership Institute, H&R Block, Mattel, and dozens more. Throughout the book, she illustrates how each step of the process works using real-life examples. Susan Fowler ’s book is the groundbreaking answer for leaders who want to get motivation right! In a work setting too often as a manager you work harder and harder to try and get people to achieve more and to motivate your employees to want to strive for higher goals. Many times as a manager you get frustrated when this does not work and you are left in the same place you started. This book makes you take another look at motivation and what truly motivates people. I loved the idea that she brought to the table about the psychological needs of individuals. These needs made me re-think what I have been doing, especially in regards to my own workplace. The author gives you the freedom to take a risk and to not beat yourself up if the employee makes choices that are contrary to what you hope that they make and inspires you to lift up and empower your employees in a new, and in my perspective, more powerful way. So gain a better understanding of motivation and how you can become a better, more effective coach, mentor, boss, and more with this great book! SSD Slim S60 Offers Great Value & Performance! Book Review - What's the Big Idea, Charlie Brown? Pascha Takes Chocolate To The Next Level!